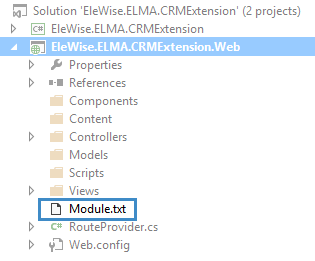 Before creating a module, please read the article Creating module in ELMA. We need a web module to show information to users in the web application. 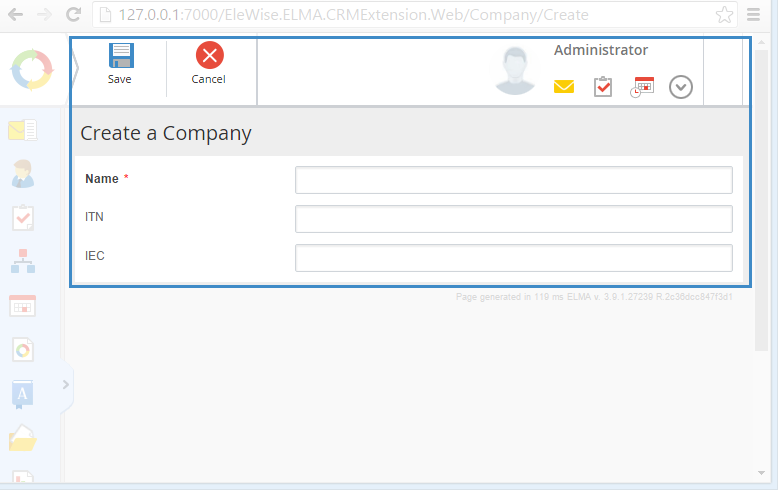 ELMA module system is based on Orchard CMS 1.0. 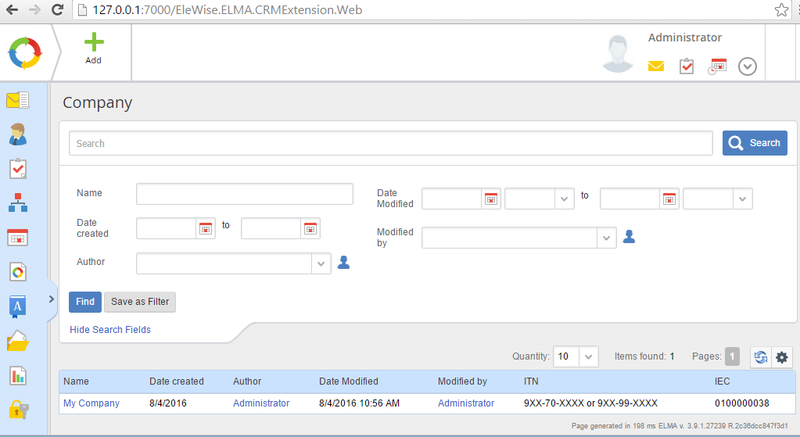 Suppose, we need to create a CRM module (please, read Create a server module before continuing). Learn more about the Orchard modules in this article. For your module, you will also need to specify the dependencies of base system modules (learn more in Structure of web modules). 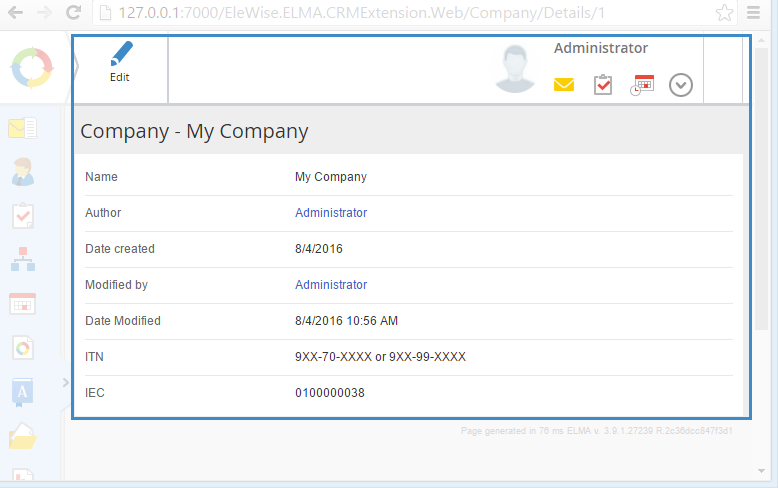 We will create a two-tier menu with CRM at the first tier and with Contacts item at the second tier. First tier items from ELMA left menu have 24x24 icons, second tier items – 16x16. All images must be located in ../<ELMA>/Web/Content/Images. 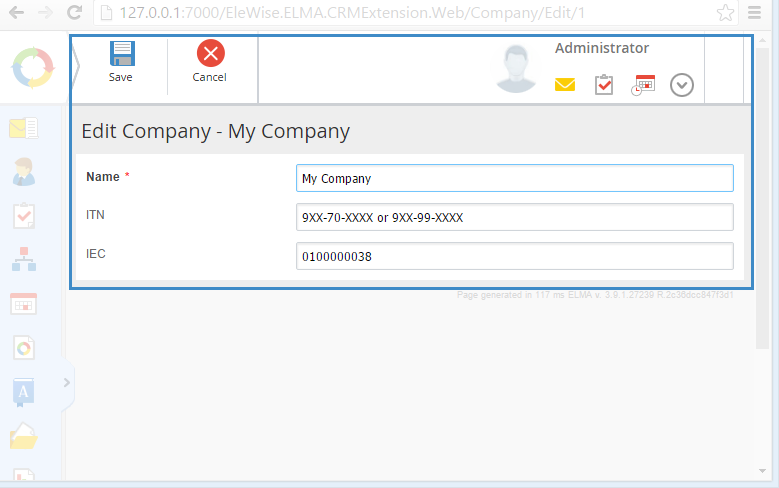 As you can see, in this action we create a new instance of the MyCompany entity and pass it to the view. Following the MVC pattern, try to remove any complicated logic from your controllers – you have Models for that. Use Toolbar() to create a top toolbar. Here we use Manager and Notifier properties from the base class. As you see, this method is also simple and does not contain any complicated logic aside from exceptions’ handling. In fact, we do not even need to handle the exceptions here, because the base class already have these handlers – if an exception is thrown, it will be processed in the same way. When we call Manager.Save (company) method, the entity will be saved to the database. Now we must add a function to view entities’ information/list of entities. There we used Html.Toolbar() method to add an option to edit entity’s properties to the entity’s view form. After saving, you will be redirected to the entity’s view form. CreateFilter() function creates new the FilterModel object that is used to display the filter in the Grid.cshtml. We will provide more details on it below. The InstanceOf class we use to implement interfaces to create object instances. 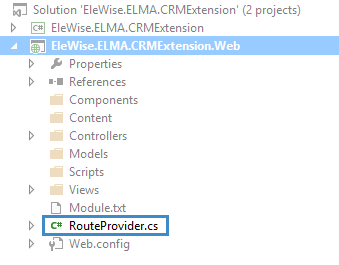 You must specify the default route for the module in the RouteProvider.cs file. By default, this route is the Index method of the Company controller. DataFilter here has the FilterModel type. Using the Builder function, we fill in the required fields to create the FilterModel instance to pass it to the FilterModel.cshtml. This action will be called during sorting, moving between web pages and some other actions. The attribute of the filter parameter defines the prefix that will be added to the element on the web page. Please note that override modifier is necessary here, as well as optional parameters FilterId and searchTasksType. We must add them because the Grid method is already defined in the controller’s base class.